Can Betta fish live with others? The answer: it’s complicated. Known for their aggressive displays, including tail beating, biting, and raising the opercula. They can be fiercely territorial. So it’s no surprise the vast majority of people recommend you house them alone. …it’s not easy to house your Betta with other. However, It can be done. So, if you want some tank mates for your Betta–keep reading. 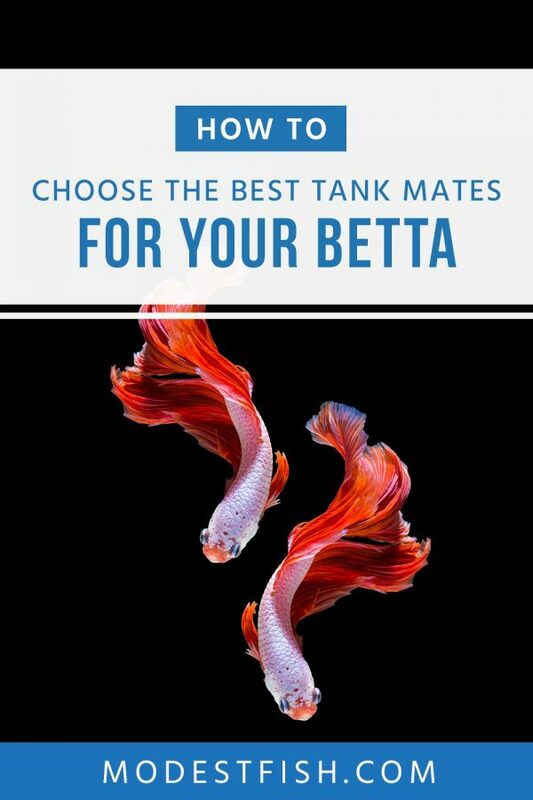 You’re going to learn the guidelines to choosing the best buddy for your Betta. Then at the end, I’ll share my recommendations. Warning: Every Betta is different. Some just don’t get along with anyone. Even if someone else has had success, doesn’t mean it will work for you. Always have a backup plan in case things go south! 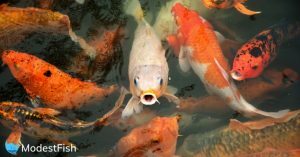 Can Betta Fish Live With Other Fish? As I mentioned above, all Betta fish have different personalities so there are no solid rules. 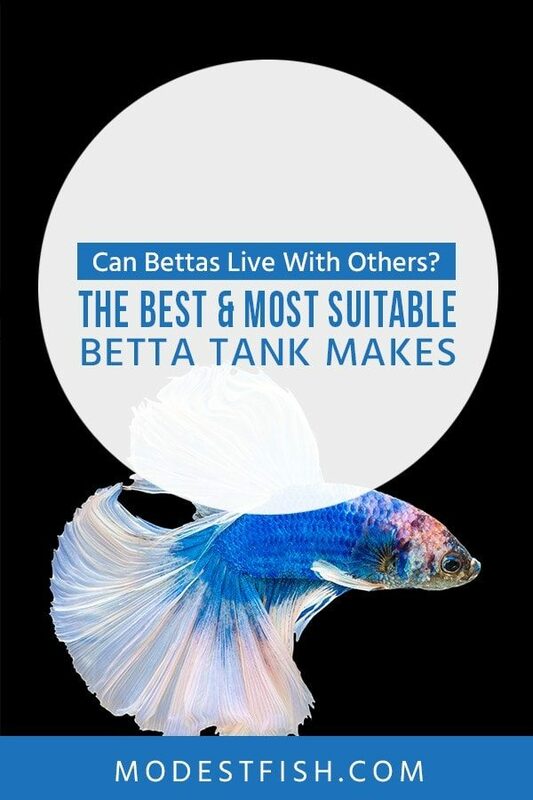 However, many hobbyists have had success keeping a Betta in a community. And it’s not just the males. Females can be just as aggressive! 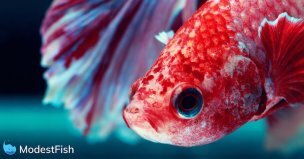 Anything that looks too much like another Betta will cause stress and might be attacked. Avoid colorful and long-finned fish. Guppies (Poecilia Reticulata) and lyre-tail mollies (Poecilia Latipinna) are good examples. Some schooling fish like neon tetras lack the long fins but are still very colorful–skip those as well. Most importantly, never combine two male Bettas. They aren’t called fighter fish for nothing. These fish were bred to fight each other. Despite their aggressive reputation, all your Betta really wants to do is chill. Unfortunately for you, this excludes a lot of possible tank mates. You shouldn’t add any fish which are very active, e.g., Dianos and Minnows. Species that’ll bother your Betta are an even bigger no-no. Nippy Barbs, semi-aggressive Dwarf Cichlids, hungry Crayfish–avoid ‘em all. Even if they don’t directly bother your Betta, some species can still cause stress by getting in the way. Avoid any tank makes who inhabit the same areas of your aquarium. Top dwellers like Clown Killifish (Epiplatys Annulatus) won’t be appreciated. The same goes for fellow anabantoids (like Gouramis). This type of fish uses a special organ called a labyrinth to breathe air from the water’s surface when oxygen levels are low. Because of this, they’re likely to inhabit the same areas which could cause problems. The harsh reality… a lot of fish don’t match your Betta’s requirements. 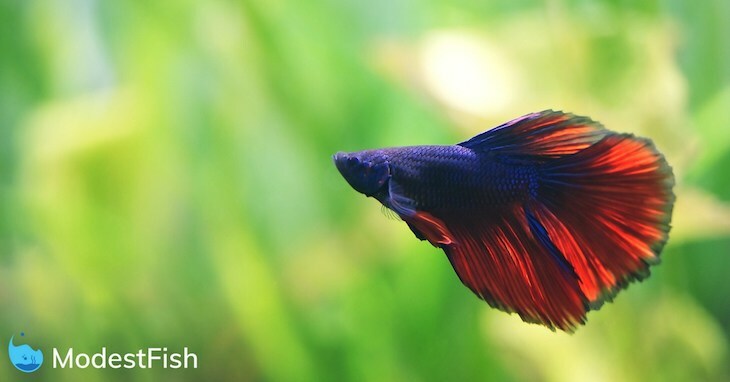 Your Betta needs soft and slightly acidic water, with a stable pH value between 6.8 and 7.4. This is on the low side for a lot of livebearers like guppies. So it’s not just their colors and long fins that exclude those, they also just wouldn’t be happy in a Betta tank. Then you’ve got the water temperature. Your Betta loves the water to be pretty toasty–between 75 and 80°F. Now, this is actually too hot for some fish that are often listed as “good Betta tankmates”. Including White Cloud Mountain Minnows (Tanichthys Albonubes) and Danios. Remember your Betta wants to chill? You need to create a calm environment. This means your Betta doesn’t like a strong current or a bare tank. If a potential tank buddy likes either of those, it’s not a match. Requiring a minimum tank size of 5 gallons–Betta are one of the few fish able to thrive in nano tanks. If your tank is smaller than 10 gallons, forget about fishy tankmates. Go for invertebrates only–it’s too small for fish! Important: Your Betta doesn’t need tank mates. In many cases, it won’t even want one. If you’re adding tank mates to your Betta tank, it’s because you want to. So choose carefully or even skip the tank mates altogether. Don’t risk the well-being of your fish just because you want to keep as many as possible. So we’ve discussed what you need to look for when choosing a buddy for your Betta. Amano shrimp: These translucent shrimp are large enough to avoid being eaten and peaceful enough to leave your Betta alone. They’ll also eat algae! How’s that for a multifunctional tankmate? Be sure to always have a backup tank for your Amanos. An aggressive Betta may try to take a bite out of them! Snails: Small snails, like Nerites and Assassin snails, work well in aquariums of any size. They won’t bother your Betta and most Bettas won’t bother them (there might be some occasional antennae nipping). Nerites are great algae eaters and Assassins live up to their name by eating any pest snails they can find. Both make for an awesome clean-up crew. Pro Tip: Larger snails, like mystery snails, are also fine. But, with big snails come big poops, meaning they’ll only work in tanks 15 gallons and up. Otocinclus catfish: These tiny catfish are calm and won’t attract your Bettas attention. As an added bonus they’re algae eating champions. A group of them will keep your aquarium glass squeaky clean. Go for at least 5 so they can feel safe. But, more is better. Warning: Otocinclus can be pretty fragile and quite shy. If you don’t have much fishkeeping experience, it’s best you go for a different species on this list. 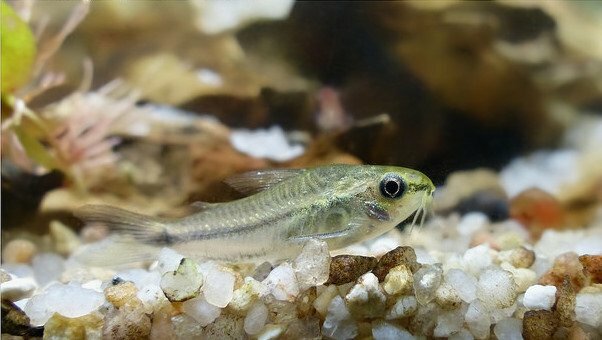 Pygmy Corydoras: There are three tiny varieties of Corydoras catfish: Hastatus, Habrosus, and Pygmaeus. Although they look slightly different, their care is the same. As bottom feeders, they love sifting through the sand in search of any tasty bites their tankmates have missed–reducing the chance of you experiencing an ammonia spike due to rotting leftovers. A group of them can really liven up your tank with their fun little personalities! Pygmy Cories are too small to bother your Betta and have plates of bone-like material covering their bodies. So they won’t easily fall prey to a nippy fighter fish. Keep at least 6 in a 10 gallon or up aquarium. The more floor space, the better. Bristlenose Pleco: Bristlenose plecos and other medium-sized catfish (also known as L-numbers) match well with Betta fish because they’ll never get in each other’s way. Sticking to the bottom of your tank, they’re simply too large for your Betta to bother them. And even if your Betta attempts to nip, any attempted will be deflected by their tough skin. Because Bristlenose Plecos grow up to 4 inches, you won’t be able to keep them in a small tank. You’ll need at least 30 gallons or you might end up with water quality issues. Warning:Double Triple check you’re getting a Bristlenose Pleco. Common Plecos look similar, but can reach a size of 2 feet! 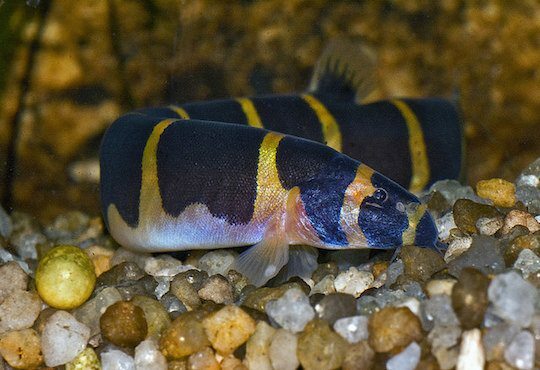 Kuhli loaches: There are a number of Loaches that might work with your Betta fish. Like Dwarf loaches and the rare Panda loach. However, there is one clear loach winner: Kuhli loaches. They make an excellent match because they spend a lot of their time hiding and looking for food in your tank’s substrate. With no long fins, your Betta will have nothing to nip at. In fact, your Betta probably won’t even notice they’re there! A 15 gallon or up tank, with plenty of floor space and hiding spots. Get at least 6 of them: they love each other’s company and can often be seen piling up with as many as possible. Marimo Moss Balls: I’ll admit it: these fluffy green balls aren’t quite as lively as the animals on this list. They’re also not made of moss, but a type of filamentous algae that sticks together and won’t spread all over your tank. Not only are they decorative, but they’re also very useful, it’ll work to keep your ecosystem balanced by reducing nitrates and producing oxygen. And if you’re not a green thumb–no worries. They’re super easy to care for, almost indestructible, and it’ll create its own food through photosynthesis. Pro Tip: They don’t like the temperature being too hot, so keep the temperature under 77 °F. 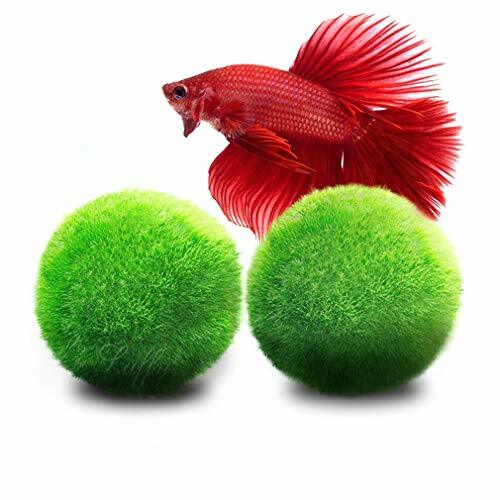 Marimo Moss Balls keep your Betta entertained and your aquarium's environment clean. If you’re currently keeping your Betta in a tank smaller than 10 gallons, you can’t add any more fish. You’re Betta is going to need its own space within the community, and most schooling fish will need at least 10 gallons. I recommend you use at least a 20-gallon tank. In fact, don’t add any fish to your Betta tank. You should add your Betta to an established aquarium. Introducing others to his environment could make your Betta feel like his territory is being invaded; making it stressed or aggressive. There is no guarantee this is going to work. So have a 5 gallon tank ready in case things turn sour. This is a step I recommend you use when adding any animal (or plant) to an established aquarium. Quarantining your Betta in its own tank for a few weeks and monitor its condition. During this period, keep a close eye on it. Make sure it doesn’t show signs of disease or parasites, it eats properly and behaves normally. Make sure your tank’s environment is suitable for your Betta. This shouldn’t be too much of an issue if you’ve followed the rules and are keeping fish with similar requirements. For more information on the creating the perfect environment for your Betta, check out these two articles: here and here. Float the bag or container in your community tank, allowing your Betta to get used to the environment. You want the water in your bag or container to get close to the same temperature in your tank. This can take up to 1 hour. Now the water has reached a similar temperature, it’s time to add water from your aquarium. Every four minutes, add ½ a cup of water to the container or bag until it is full. Then empty out half of the water and repeat the same process. 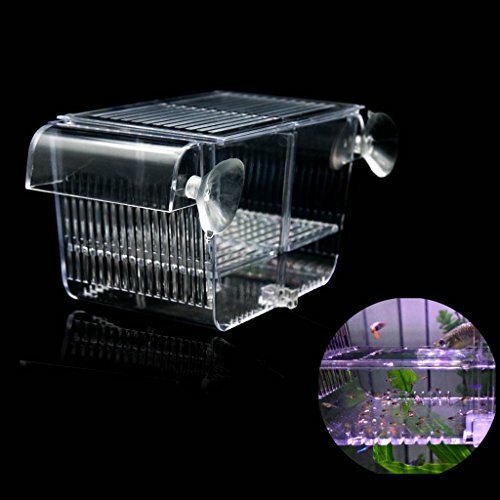 After the second time, you can let your Betta swim freely into your tank. Your Betta floating alone in a corner of the tank. Disappearance of community fish (Your Betta probably ate them). If you’re worried there’s conflict – execute your back up plan. Final Thoughts: Should You Keep Bettas in a Community Tank? 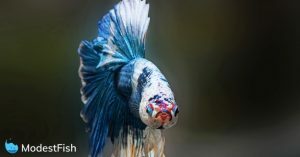 Remember, keeping a male Betta in a community is a risk – it may or may not work because Bettas have different personalities, and some will be more aggressive than others. You’re going to have to weigh up your options. Is it worth the risk? That’s up to you. But, my opinion, if you’re a novice I wouldn’t recommend attempting this. If you decide yes, make sure you pick a suitable buddy and keep them in a large tank. If you’ve got your own suggestions or success stories, let us know in the comments. We’d love to hear from you. A special thank you to Mari from Aquariadise.com for collaborating with us on this article. If you haven’t seen her blog before, it’s packed full of accurate and helpful aquarium information. I got a bristlenose pleco today! I have a 16 gallon tank (filtered and heated of course! A lot of live plants too) My betta was pretty chill about the pleco. He only flared once and then ignored him completely. I hope they’ll get along! so at school we are doing a project, each student gets 3 fish to take care of however they want and if they are still alive by the end of it you get to keep them. I own a Betta and am probably getting a 5 gallon tank for my birthday. So could I actually house my male with those 3 fish? I’m not sure what kind of fish yet but I’ll get back to you on that. If not I guess I’ll have to give them to my friend.